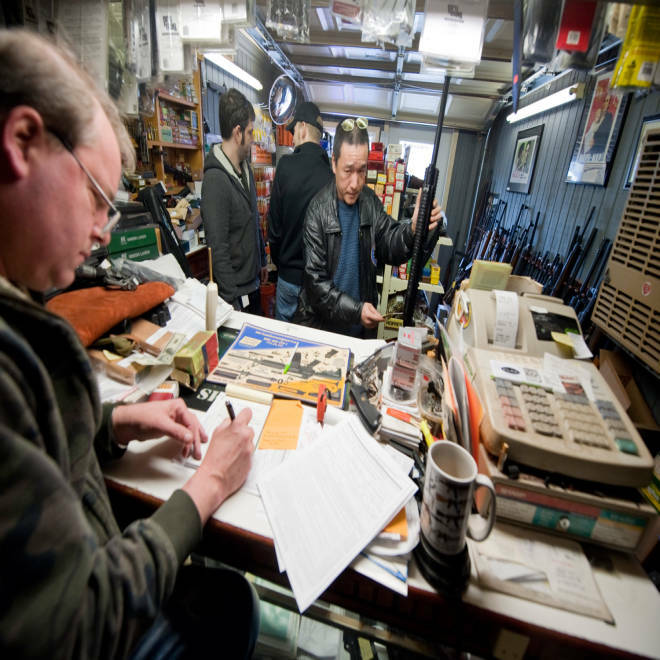 Vic Benson, owner of The Freedom Shoppe, records the sale of an assault weapon during a sale in anticipation of new gun control measures in New Milford, Conn., April 2, 2013. Gun stores all over Connecticut were packed Tuesday, one day before lawmakers voted on a sweeping package of laws that banned military-style assault weapons and magazines that hold more than 10 rounds. “They’re insane. I’ve never seen them so busy before,” shopper Shari Reilly, who bought up several high-capacity magazines, told NBC Connecticut. Gov. Dannel P. Molloy, a Democrat, said he will sign Thursday what could be “the toughest law passed anywhere in the country." Connecticut will become the latest of a handful of states – following Colorado and New York – to enact strict new gun-control legislation after the mass shootings in an Aurora, Colo., movie theater and Newtown, Conn., shool. President Obama was scheduled to speak in Colorado on Wednesday to push new federal laws. Gun manufacturers, ammunition makers and gun store owners in Connecticut have said their businesses will be threatened if a stringent new gun control bill becomes law. “I feel like we have one foot being pushed out the door,” Mark Malkowski, the owner of AR-15 manufacturer Stag Arms, told NBC Connecticut. He said his company has received nearly two dozen incentive-laden offers to move out of the state. A Connecticut gun store employee who asked not to be identified told NBC News that his store is selling five times the usual amount. “When your governor is threatening to take away your guns, what do you think is going to happen?” he said. Bob Montlick, owner of Bob’s Gun Exchange in Darien, told the Connecticut Post he believes people will try to get firearms while they can. "The only people who are going to comply with any of this are going to be the honest ones," Montlick told the paper. "The bad guys are going to get what they get or steal with anything else." Hoffman’s Gun Center and Indoor Range in Newington reported brisk business on Tuesday as customers scraped shelves for whatever was left. The National Shooting Sports Foundation, a trade association based in Newtown, said that it opposed the proposed legislation in a press release on Tuesday. “We have a situation where law-abiding citizens will face greater restrictions on their Second Amendment and state constitutional rights while Connecticut’s firearms manufacturers will be forced to pay a price economically for the state’s double-standard of you can build it here, but not sell it here, public policy formulation,” the NSSF said in the statement. Frenzied buying at gun stores nationwide has been reported ever since the shooting that left 26 children and educators dead at Sandy Hook Elementary School. Store owners and customers have cited the threat of new state and federal controls on guns and ammunition as the cause. Documents obtained by NBC News in January through a Freedom of Information Act request showed that background checks on gun sales in Connecticut rose in the hours following the Newtown shooting. Between 11 a.m. and noon on December 14 – just as news of Adam Lanza’s rampage was breaking – Connecticut gun dealers logged nearly double the number of backgrounds checks performed in the same hour a week before, the FOIA documents show.